High oleate is an important seed quality trait frequently incorporated in peanut varieties. Crop wild relatives (CWR) are potentially useful genetic resources for cultivar improvement through genetic introgression; but for wild peanut species, many chemical or nutritional traits are not well characterized. A mutant from Arachis veigae S. H. Santana & Valls (2n = 2x = 20), with increased oleic and very long chain (C ≥ 22) fatty acid content was identified from screening 209 accessions of 45 species using gas chromatography (GC). The A. veigae (formerly A. sylvestris) accession, VVeSv 8373 (PI 688970) contained 55.5% oleic acid in seeds, significantly higher than the average (18.3%) of other accessions within the same species and also significantly higher than the average (37.0%) of all wild peanut accessions evaluated. 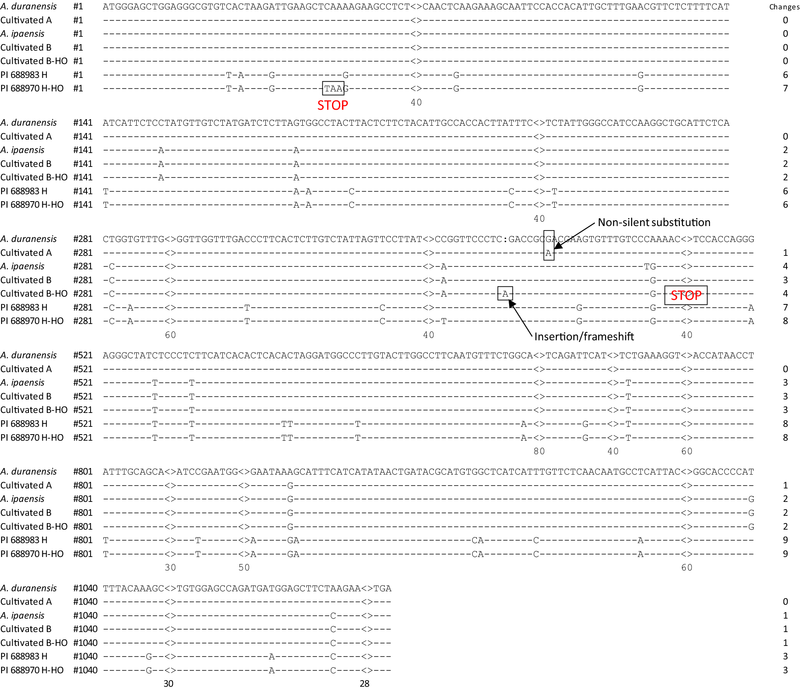 A C37T substitution was identified by sequencing the coding region of FAD2H, resulting in the nonsense mutation of Q13* (a premature stop codon). This functional mutation may significantly reduce the fatty acid desaturase (FAD) activity and result in the enhanced oleate level. Arachis veigae also contained a high percentage of very long-chain (C ≥ 22) fatty acids, and their variation identified in this study is also discussed and compared with other species. The mutant with such an altered fatty acid composition may be useful for potentially improving seed or food nutrition quality. Peanut (Arachis hypogaea L.) is an important oilseed crop which is grown worldwide and mainly used for oil production. It also contains a high percentage of protein (~ 25%) making it an important source of nutrition, especially for many in underdeveloped countries. In addition to oil and protein, many other useful compounds (polyphenols, antioxidants, minerals, vitamins, and resveratrol) have been identified in peanuts. Consuming food products with these compounds can benefit human health. Therefore, peanut can be considered a functional food . Crop wild relatives (CWR) are valuable germplasm resources for new cultivar development and improvement . There are 82 species including the cultivated peanut A. hypogaea within the genus Arachis [3, 4, 5], and except A. hypogaea, the remaining are considered as peanut wild relatives. Some of the wild species have been successfully used for peanut cultivar improvement, especially for disease and insect resistance [6, 7, 8, 9, 10, 11, 12]. More detailed information can be found in a recent review by Stalker . However, research on seed quality of wild peanut species has been minimal, and only a limited number [75, 17 and 39] of wild species were evaluated for certain quality traits including protein and oil content, fatty acid composition, and sterol composition [14, 15, 16], respectively. Additional information on seed quality traits will be valuable for using wild species for nutritional enhancement of cultivated peanut. The Plant Genetic Resources Conservation Unit (PGRCU) of USDA-ARS in Griffin, GA, maintains a large number of wild peanut species accessions. To evaluate the seed quality of wild peanut species, 209 accessions covering 45 species were grown in a greenhouse; and freshly harvested seeds were used for chemical analysis including oil content, protein content, and fatty acid composition as well as relative seed size . 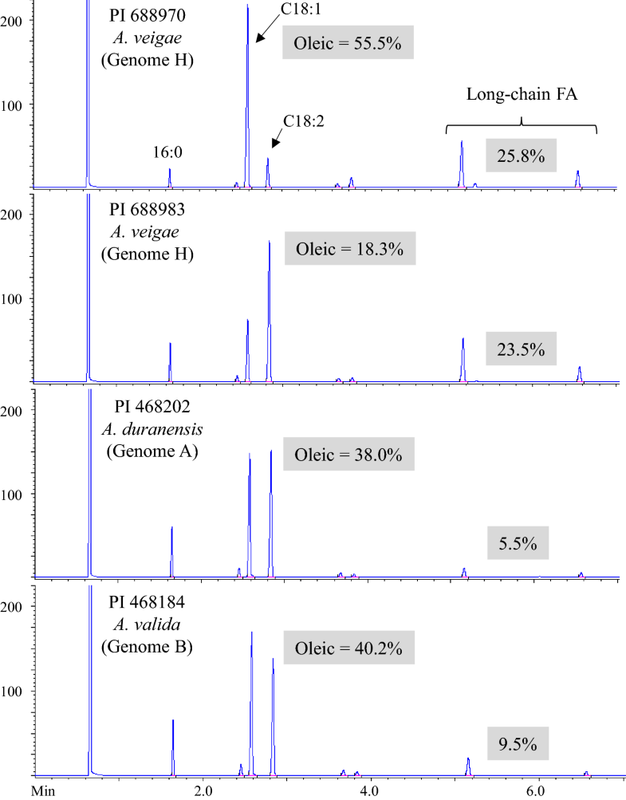 From this screening, one mutant in A. veigae was identified with a higher level of oleic acid. Arachis veigae was previously classified as A. sylvestris, which is a highly dispersed wild species within the genus . It is a diploid species with an H genome  and belongs to the section Heteranthae. It is significantly diverged from the A and B genomes of diploid species of section Arachis, the section that includes the cultivated peanut. Therefore, the objectives of this study were to (1) determine the fatty acid profile of this mutant line, (2) identify the functional mutation on the FAD2H gene by sequence analysis, and (3) compare fatty acid profiles of accessions of A. veigae and selected diploid wild species. Seeds of 209 accessions of 45 wild peanut species were obtained from the PGRCU, GA. In 2016, five seeds from each accession were planted in 14″ diameter panterra pots. After maturation, the pods were harvested from each plant, and four accessions (PI 468202, A. duranensis representing genome A; PI 468184, A. valida representing genome B; PI 688970, and PI 688983, A. veigae representing genome H) were selected for this study. Freshly harvested seeds were used for chemical analysis. Fatty acid analysis followed a previously published method by our laboratory . Ten to 20 seeds from each accession were ground to a powder, and a small amount was sampled for preparing fatty acid methyl esters by alkaline transmethylation. Fatty acid composition was determined by gas chromatography for identifying and calculating relative peak areas. Measurements for each sample were performed in duplicate. Freshly-harvested seeds from the four accessions used for chemical analysis plus two cultivated materials (Tifrunner and F435) were grown in the greenhouse for DNA extraction. Leaf tissue (75–100 mg) was collected from freshly unfolded young leaves, and DNA was extracted using an Omega Bio-Tek E.Z.N.A. Plant DNA kit (Norcross, GA). DNA quality and quantity were determined on a Nanodrop 2000C spectrophotometer, and DNA concentration was adjusted to 10 ng/µl as template for amplifying the FAD2 coding region. Initially, gene-specific primers for FAD2A (5′ GAT TAT TGA CTT GCT TTG TAG TAG TGC 3′ and 5′ ACA CAA ACG TTT TCA ACT CTG AC 3′) and FAD2B (5′ CAG AAC CAT TAG CTT TGT AGT AGT GC 3′ and 5′ ACA CAA ACG TTT CCA ACT CTG AC 3′) were tested to determine amplification success in genome H of A. veigae. The forward FAD2A primer spans an insertion upstream of the coding sequence not found in FAD2B, thereby discriminating the two genomes . 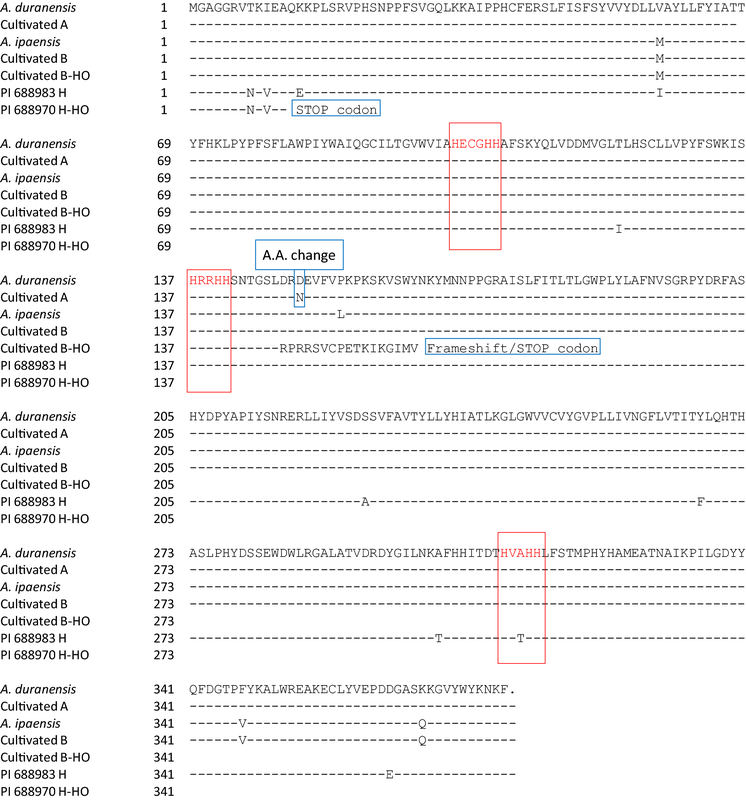 Neither primer pair amplified the FAD2H gene in the A. veigae accessions. Using published peanut FAD2 sequence data, various additional primer combinations were designed and tested. Preliminary sequence data from other Arachis species showed variation in the flanking regions compared to that of cultivated peanut including several indels of varying sizes (unpublished data). Based on these results, a set of primers was designed in conserved regions flanking the FAD2 coding sequence that successfully amplified genome A, B, and H species: FAD2F6 and FAD2R6 (5′ GTC ACT CTC ATC TGC AAT GAC TAT C 3′ and 5′ ACA TGG CAA ATC CAC ACA CA 3′). PCR was performed using GoTaq® G2 Green master mix (Promega), and the cycling conditions consisted of 1 cycle of 94 °C for 5 min, 35 cycles of 94 °C for 30 s, 57 °C for 30 s, 72 °C for 105 s, and a final extension of 72 °C for 7 min. Amplicons were sequenced using the PCR primers and two internal primers (5′ AAG GGC CAT CCT AGT GTG AG 3′ and 5′ CAT GGT TGG TTT GAC CCT TC 3′) to completely cover the coding regions. After trimming each sequence, consensus sequences were assembled using Sequencher, ver. 5.3. By comparing sequences between species and accessions, nonsynonymous SNPs were identified and likely linked to genes responsible for changes in fatty acid composition. The fatty acid composition data from selected wild peanut species are listed in Table 1, and chromatography profiles are shown in Fig. 1. PI 688970 and PI 688983 were originally collected in Brazil by Renato Veiga (Instituto Agronomico) and other colleagues and then donated to PGRCU by Dr. Charles Simpson (Texas A&M University) in 1993. The original name for this species was A. sylvestris, but it was recently changed to A. veigae [5, https://www.ars-grin.gov]. Seeds from PI 688983 contained a very low percentage of oleic acid (18.27%) and a very high percentage of linoleic acid (45.7%) (Table 1). By comparison, PI 688970 contained a high percentage of oleic acid (55.52%) and a very low percentage of linoleic acid (8.72%). The oleic acid level in this mutant was also higher than the oleic acid levels in A. duranensis (PI 468202, 37.98%) and A. valida (PI 468184, 40.15%). In addition, accessions of A. veigae contained high percentages of very long-chain (C ≥ 22) fatty acids. PI 688970 and PI 688983 contained 18.15% and 16.99% behenic acid (C22:0) and 6.28% and 5.94% lignoceric acid (C24:0), respectively, much higher than PI 468202 (3.71% and 1.82%) and PI 468184 (7.16% and 2.32%), respectively (Table 1 and Fig. 1). These results are consistent with data collected on other A. veigae accessions (not shown) and a previous report  where PI 688981 (A. veigae) measured 15.81% behenic acid and 5.31% lignoceric acid, higher than most of the other species evaluated in that study. Although the PI 688970 contained only 55.5% oleic acid (as opposed to 75–80% which is considered high oleic in cultivated peanut), it also contained a high percentage (25.8%) of very long-chain fatty acids. This unique fatty acid combination makes this mutant a potential new germplasm resource for oil quality improvement. For the 1140-bp coding region of the FAD2 gene and 379-aa peptide of fatty acid desaturase (FAD) enzyme, seven assembled nucleotide sequences and deduced peptide sequences are shown in Figs. 2 and 3, respectively. For this comparison, two nucleotide sequences containing FAD were included from two diploid wild progenitors (A. duranensis, genome A; A. ipaënsis, genome B) of the tetraploid cultivated peanut (AABB), two from the A. veigae accessions [PI 688983 and PI 688970 (genome H], two sequences from subgenomes A and B of cultivated peanut (Tifrunner), and one sequence was from subgenome B of the cultivated peanut F435 (containing a 442A insertion for high oleic acid, designated as subgenome B–HO) [21, 22, 23]. For single nucleotide polymorphism (SNP) identification, the sequence from A. duranensis deposited in Genbank was used as a reference, and all other six sequences were compared to it. Number of SNPs identified and amino acid changes are summarized in Table 2. There was little difference between the subgenome A of cultivated peanut Tifrunner and the A genome of A. duranensis with only two SNPs identified. This is reasonable because the subgenome A of cultivated peanut most likely originated from the A genome of A. duranensis. One mutation was synonymous (substitution of A907G), while another was nonsynonymous (substitution of G448A) resulting in an amino acid change of D150N (Fig. 3) and ~ 20% increase in oleic acid [20, 22, 23]. Eleven common SNPs were identified between subgenome B-HO of cultivated peanut, genome B of A. ipaënsis and genome A of A. duranensis. Additional SNPs were identified for A. ipaënsis (C464T substitution) and for subgenome B-HO (442A insertion), respectively (Fig. 2). There were eight common silent SNPs for subgenome B of Tifrunner and genome B of A. ipaënsis (Table 2). 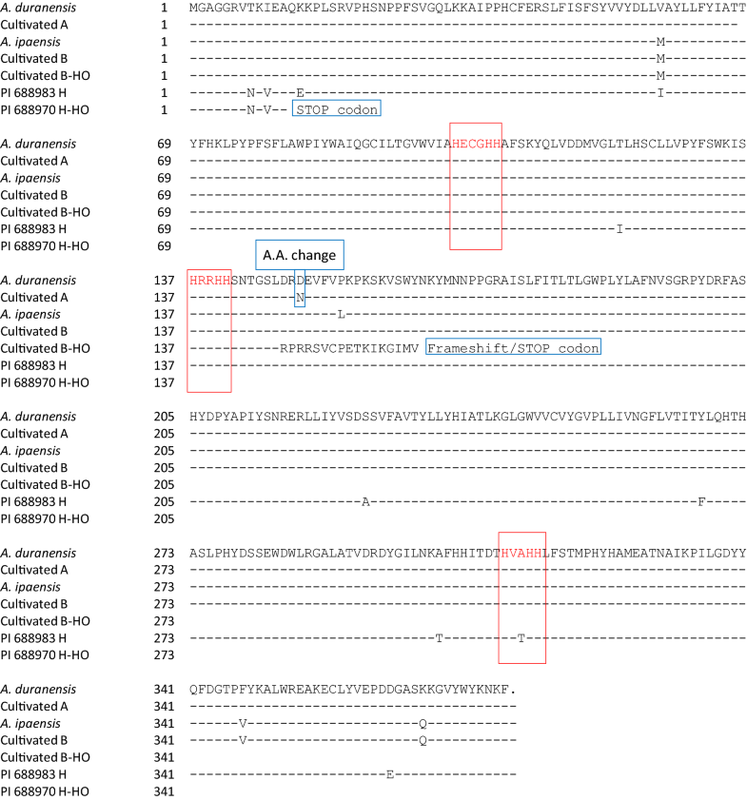 Three common amino acid changes (V58M, F347V, and K369Q) were found for subgenome B of Tifrunner and genome B of A. ipaënsis. There was an additional amino acid change (P155L) for genome B of A. ipaënsis. The previously known and well characterized insertion 442A (a point-nonsense mutation) in subgenome B-HO of the high oleic cultivated F435 resulted in a premature stop codon (Fig. 3) and about 15% enhancement of oleic acid [20, 22, 23]. A higher number of SNPs were observed from PI 688983 (39) and PI 688970 (41), relative to A. duranensis. This indicates that genome H of A. veigae is more diverged from genome A of A. duranensis than genome B of A. ipaënsis in the genome region studied. Within the two accessions of A. veigae, 39 SNPs are common with PI 688970 containing two additional SNPs (Fig. 2). There were 10 amino acid changes in PI 688983, but none of these affected the oleic acid content. However, a critical SNP (C37T) exists in PI 688970, which resulted in a premature stop codon (Q13*). This nonsense point mutation likely reduces the catalytic activity of the desaturase enzyme leading to decreased production of linoleic acid and therefore increasing the oleic acid level by 37.25% (Figs. 1, 2, 3). Interestingly, for PI 688983, there was an amino acid change (A313T) which was located in the histidine box (His box) (Fig. 3). These His boxes were proposed to contribute to fatty acid desaturase activity by ; but in this study, the amino acid change in one of the His boxes did not have a significant effect on the level of oleic acid. Peanut wild relatives are well conserved in germplasm collections with nearly 1000 accessions encompassing 82 species , but these wild species are not well exploited for utilization due to crossability barriers and ploidy level differences that lead to sterility in the resulting hybrids. There are many seed quality traits which can be studied, but to date only a few of these (oil, protein, and fatty acid composition) have been evaluated. The accession PI 688970 of A. veigae, with 55.5% oleic acid, is 15–20% higher than other Arachis species and about 35% higher than other A. veigae accessions; but it is lower than the 75–80% oleate found in high oleic cultivated peanuts. However, if gene action is additive for fatty acid profiles as reported , then the percentage of oleate should increase if the corresponding A. veigae gene (FAD2H-HO) can be introgressed into A. hypogaea. Since there was no crossability between A. veigae and A. hypogaea, a ‘bridge’ species (that can be hybridized with both A. veigae and A. hypogaea) should be identified for the introgression of useful traits from A. veigae to A. hypogaea. Possible explanations for the lack of true high oleate mutants similar to the cultivated high oleate identified in the wild species include (a) not enough of the existing germplasm was screened; (b) there are no high oleate mutants in the existing wild species germplasm; (c) the high oleate trait can only be derived from the additive combination of two diploid genomes with an intermediate level (~ 50%) of oleic acid as found in the high oleate cultivated peanut. A fourth explanation is that, despite PI 688970 having a mutation that could result in a high oleate oil, additional genetic changes limit the amount of C18 fatty acid available for the additional accumulation of oleic acid. Accessions in the section Heteranthae have much higher concentrations of very long-chain fatty acids, thereby reducing the relative concentration of C18 length fatty acids. 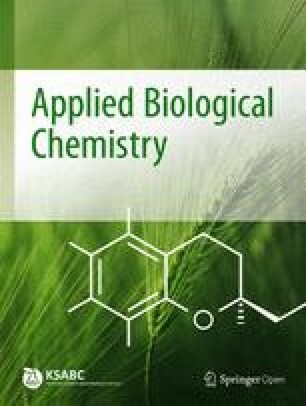 Regardless of the reason, this newly identified wild species mutant is unique and may potentially be an important genetic resource for increased oleic acid and very long-chain fatty acids. Further, our results suggest that there is potential for finding other agronomically desirable mutants in the Arachis species germplasm for cultivated peanut improvement. MLW and BT contributed to the design of the research. ST planted wild species and collected seed samples. VT and HTS regrew the mutant plants in the greenhouse. BT conducted DNA sequencing, GC and data analysis. MLW wrote the manuscript and HTS helped to revise the manuscript. All authors read and approved the final manuscript. The authors gratefully thank Ms. Phiffie Vankus and Sarah Moon for their excellent assistance on seed germination and Drs. Charles Y. Chen and Noelle Anglin for useful suggestions on improving the quality of this manuscript.